As if from an actual collection of blood relatives, the Schimscheimer Family Trio’s second album “Broken Home” opens a window into an alternate world—one in which songs become people, sounds describe stories, and music falls beyond categorization. The fake siblings (and their fake uncle) harness a mixture of woodwind, synthesizer, and percussion sounds in creating tuneful odes to their fake relatives, semi-traumatic childhood recollections, and intimidating animals of note. Michael Coleman is a pianist/composer living in Brooklyn, NY. He can be found leading his own groups (Michael Rocketship, Enjoyer, Beep!) or playing, recording and touring in a wide variety of other people's projects (Ben Goldberg, Chris Cohen, tUnE-yArDs, Sam Evian). When not playing keyboard instruments, Michael works as a recording engineer at Figure 8 Recording. Kasey Knudsen, a graduate of Berklee College of Music, has been a vital part of the bay area music community since 2002. In addition to leading a number of her own ensembles, she has performed and recorded with a wide range of artists, including Ben Goldberg, Tune Yards and Charlie Hunter. Active as an educator, she is currently a faculty member of Sonoma State University, the Stanford Jazz Workshop, the Lafayette Jazz Workshop, The California Jazz Conservatory and the Monterey Jazz Festival Education Program. A graduate of the University of Miami, Jon Arkin is an in-demand freelance drummer with many notable local, national and international artists. His drumming style has been sought out as much for his versatility as for his uniqueness. A believer in the power of listening, grooving, dynamic balance, and attunement, his collaborators attest to his ability to suit the music of the moment. 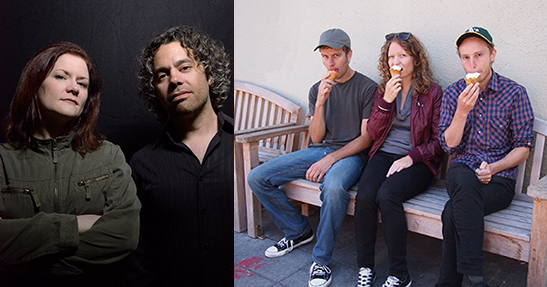 duo B., the San Francisco Bay Area improvising and composing ensemble of percussionist Jason Levis and bassist Lisa Mezzacappa, is a musical think tank of grand schemes and impossible scenarios. For more than a dozen years, the ensemble has developed and refined its singular approach to improvisation and composition, through cross-disciplinary projects with film, collaborations with improvising instrumentalists at home and abroad, study of repertoire by like-minded composer-improvisers, and immersion in the improvised-composed musical worlds of masters Wadada Leo Smith, Anthony Braxton, Cecil Taylor, Henry Threadgill, and others. Most recently, duo B. embarked on a journey in long-form improvisation with its latest project and release, No Ins & Outs (2017), an exploration of the musical vision of pianist Cecil Taylor, re-imagined for bass and drums. For this Mills College performance, duo B. will perform a version of Wadada Leo Smith’s expansive and evocative graphic score, Luminous Axis (2002). "…mysterious, complexly textured improvisations that sometimes take shape as the aural equivalent of abstract expressionist paintings, whether the ethereal, mystical canvasses of Mark Rothko or the jittery, splatter techniques of Jackson Pollock." "The duo sounds like they have been working together for a long time, they are consistently connected, sounding like they are telling a story together as one force of nature. There is a strong, spirited dialogue going on here." The music of composer, drummer, and percussionist Jason Levis lives in the rich spaces where styles intersect and musical languages merge. His career began playing guitar in a high school reggae band, and he has since broadened his artistic scope to include jazz, contemporary improvisation, and modern classical composition. His wide-ranging creative efforts are skillfully bound by his innate sense of timbre, sonic space, rhythmic force, and his insatiable interest in discovery. Over the years his passion and curiosity have led him to search out the intersections of musical paths less traveled, and the resulting unique perspective is reflected in his music. Levis holds a Ph.D. in composition from the University of California, Berkeley and currently teaches at the California Jazz Conservatory. He is active as a performer and composer in the United States and Europe. Lisa Mezzacappa is a San Francisco Bay Area composer, bassist, bandleader and producer, called “one of the most imaginative figures on the Bay Area creative jazz scene” by the Mercury News and “a Bay Area treasure” by KQED. Mezzacappa’s activities as a composer and bandleader are diverse, and include ethereal chamber music, electro-acoustic works, avant-garde jazz, music for groups from duo to large ensemble, and collaborations with film, dance and visual art. Recent projects include works inspired by noir crime fiction; by Victorian lady adventurers; and by vintage Italian science fiction comic books. Mezzacappa has been awarded residencies and grants from Djerassi Resident Artists Program, Headlands Center for the Arts, the Jazz Composers Orchestra Institute, the MAP Fund, the Foundation for Contemporary Arts, InterMusic SF, the Zellerbach Family Foundation, the Cité International des Arts (Paris), and the Andy Warhol Foundation, among others.